Have you heard about Earth Overshoot Day? Its definition (that I pilfered from this excellent website) is the date that marks when humanity’s demand for ecological resources and services in a given year exceeds what Earth can regenerate in that year. We maintain this deficit by liquidating stocks of ecological resources and accumulating waste, primarily carbon dioxide in the atmosphere. You want to know when 2017's overshoot day was? 2nd August. How depressing is that? So, seeing as governments and businesses aren't taking committed action fast enough to reverse this, it also has to be up to individuals to take steps, where we can, to cut our consumption and therefore the use of energy and raw materials. And let's face it, those of us who have the time to write and read blogs about sewing are probably lucky enough to live relatively comfortable lives, most likely in a developed country. We're the individuals that are in a position to make some changes. My thinking was: if I was making my own clothing, then I wouldn't be contributing so much to all that energy used by hauling raw materials, fabric, trims and finished garments around the globe, from cotton field to the shop floor. I would only be contributing to the fabric production and distribution bit, and powering my sewing machine and heating my iron. And I guess that that is true to a certain extent, but more recently I've been facing up to the fact that sewing is an energy and resource hungry pass time, and that it is unlikely that the carbon and water footprint of the stuff we sew for ourselves is much different than something we may have bought from Topshop. For example, making things in many multiples rather than singly saves a lot of energy per item, and fabric through tighter layplans. A lot has been written in recent years about the ills of the fashion industry, but I have yet to hear about an energy and resource study that makes a direct comparison between mass-produced and home sewn garments, anybody know of one? If one has been done, sadly I don't think us home sewers/ists would come off lightly. My feeling is that the most sustainable way to dress yourself has to be by simply wearing the garments we already have, and when those things wear out, replacing them with second hand items. However, I'm not advocating that we all stop making our own clothes; you'll have to prise my sewing machine and fabrics sheers out of my cold, dead hands. 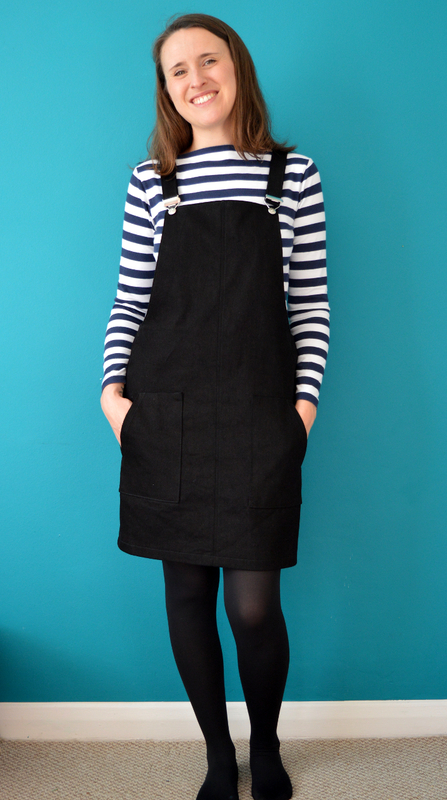 There are heaps of benefits to sewing your own clothing, Tilly unearthed many of them whilst researching her fascinating provocation paper back in 2011. So my thoughts turn to how can we make home sewing a more sustainable thing to do? Use the best quality fabric you can afford. I know that I definitely plan a project more carefully and take my time to get a great fit and finish when I'm using some really special fabric. Not only is the outcome likely to be more to your taste and body shape, but a better quality fabric will probably hold up to repeated wear and laundering. Make a toile/muslin. Although making a toile/muslin as well as the finished garment effectively uses twice the fabric than just ploughing ahead with your 'fashion fabric' (not sure why I hate that term so much), but that toile can help iron out any potential fit issues that will lead to a successful finished garment. A 'meh' garment that gets worn only a few times, or never, may well have been avoided. Plus, once you've perfected the fit of a sewing pattern, you're more likely to make multiple versions that you know will be a success, so working through that initial toile/muslin would have been even more worth while. Returning to an imperfect make. If you can dig deep and find the patience to rework a sewing project that wasn't quite right, you are likely to thank yourself later. 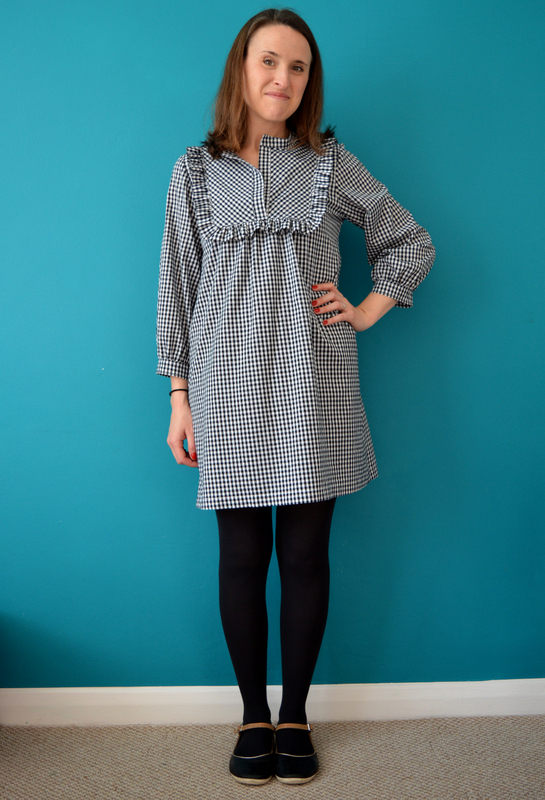 Remember this gingham modified Tova dress I made a few months ago? I eventually mustered up the arsed-ness required to make a very simple modification, raising the hem so that the proportions of the garment worked better, and now it is literally my favourite garment I own and I feel fabulous in it (see pics above). Getting a good fit. This is linked to the point about making a toile/muslin, of course, but it's worth emphasising again I think! Making a garment that not only look good on you, but also that feels comfortable and non-restrictive, will keep you reaching for that garment rather than passing it over when you're getting dressed in the morning. Let's be honest, if a garment is really comfortable, we'll often even over-look the 'looking good' bit! Hands up who's continued to wear maternity clothing for more than a few weeks after your baby was born... There is a TON of fitting advice on the interwebs, as well as many amazing books on the subject. Recently, I subscribed to a jeans fitting class on Craftsy which includes access to an amazing teacher that you can post questions to and share photos with who will respond with expert advice. I'd love to hear from you about this. Do you think 'sustainable sewing' is possible? Is the impact of this pass time a concern you've had? Can you think of any other tips for eliminating sewing project duds and making long-lasting clothing you love wearing? 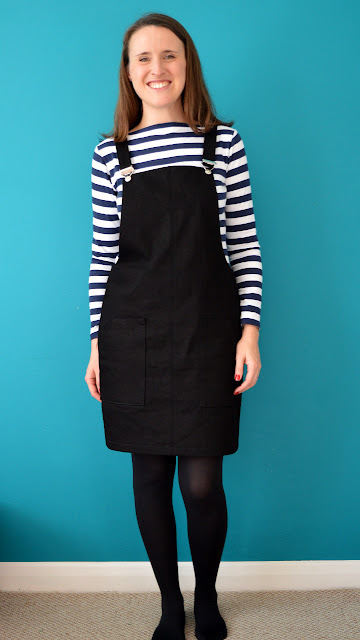 Yep, I've jumped on board the Cleo pinafore bandwagon too. When TATB first released Cleo I liked it, but didn't really think it was my style and perhaps more suited to women in their 20's. Then I saw a million of them on Pinterest and elsewhere online, made and worn by lots of different ages, shapes and sizes of women, and I've loved every single one of them and they look great on everyone. I mentioned my Cleo crush to Tilly during a lunch we had together a few weeks before her little boy was born. Afterwards, she generously sent me a copy of the pattern and set of the dunagree clips. No excuse now; this was happening! 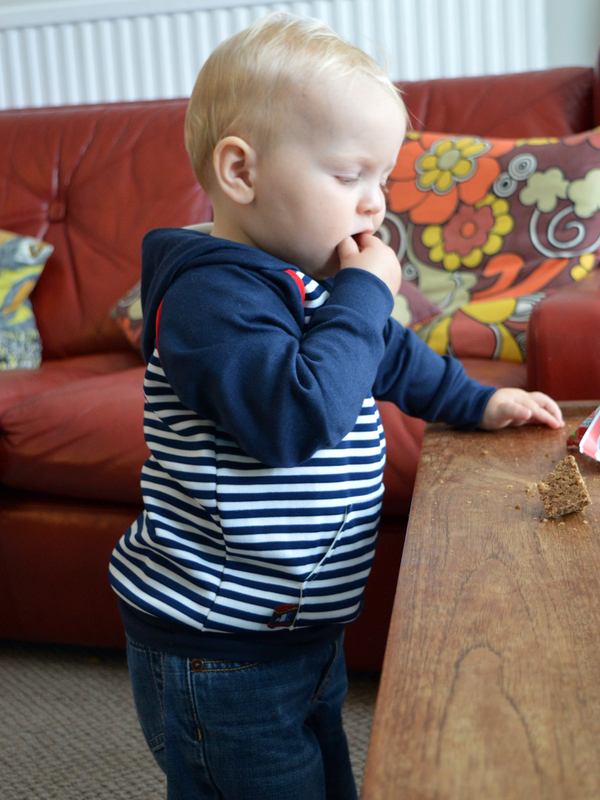 Tilly was right: this is a quick and easy project. I love working with a well-behaved, stable, woven fabric like this pattern is designed for, and I really enjoy some careful, meditative topstitching. I slowed the process down and made life difficult for myself though, because, after a mid-project fitting, I decided it was a bit loose. I took it in about one size at the side seams and continued with the construction. When it was all finished except for the hem, I tried it on again and realised that somehow it was now too small! So I unpicked a lot of my careful topstitching (I had topstitched down the side seams to get them to lay flat), and salvaged as much of the side seams as possible, taking it back out about one size. Gah! Because I can never leave well alone, I decided to veer away from the original pattern by drafting an alternative front pocket shape. 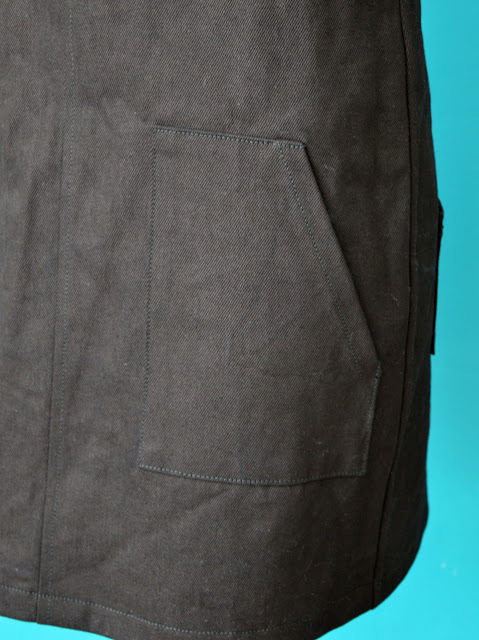 I had got the idea for these after seeing similar ones on a pinafore in Topshop; they are rectangular patch pockets with a slanted pocket opening. I'm really pleased with them, however I wished I'd stabilised the pocket opening with twill tape as I fear they will stretch out with use. I bought this incredible denim (called Super Black!) from Fabric Godmother during a visit to hang out with the Fabric Godmother herself, Josie. It's thick, strong, amazing quality, and VERY black. I pre-washed it using the old tennis-ball-in-the-washing-machine trick. I'll continue to wash it that way going forwards, but I'm pretty sure I could re-dye this pinafore easily if it starts to fade in a way that I'm not in to. I really like the utility vibe of this garment. It's like a mum-uniform; I look ready for a long hard day at the childcare coal face. I'm pleased with the finish, and I'm even happy with the short length that I was initially unsure would look very good on me. However, I've only worn it once in the few weeks since I made it. I think that that's because the denim is still very stiff and I'm not used to wearing garments that don't have any stretch in them these days. I need to force myself to wear it a few times to soften it up and get used to the feel of it. What about you? Have you had to force yourself into wearing something you've made? Did you end up loving it? I picked this hoodie pattern to write about this month because, if you were making them for a child from 18 months to 6 years old (which are the sizes that these patterns overlap) I thought it might be fun to make along side the retro sweatpants that I tried out for last month's instalment. 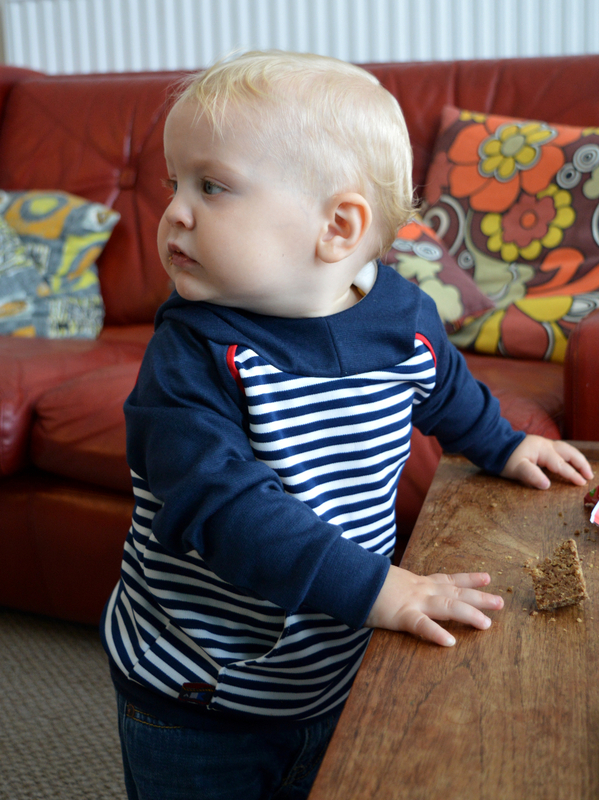 I didn't think of that before I made this hoodie, but I may dig out that anchor fabric again to make a hoodie from to create a cute tracksuit. 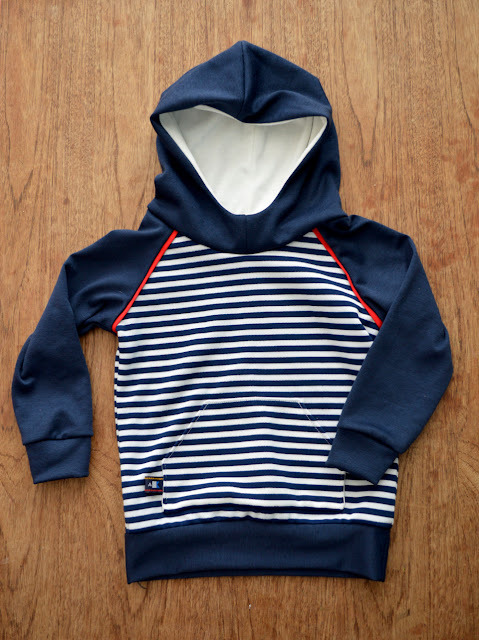 This basic hooded sweatshirt by Brindille & Twig has raglan sleeves, a kangaroo pocket and optional sleeve seam piping. 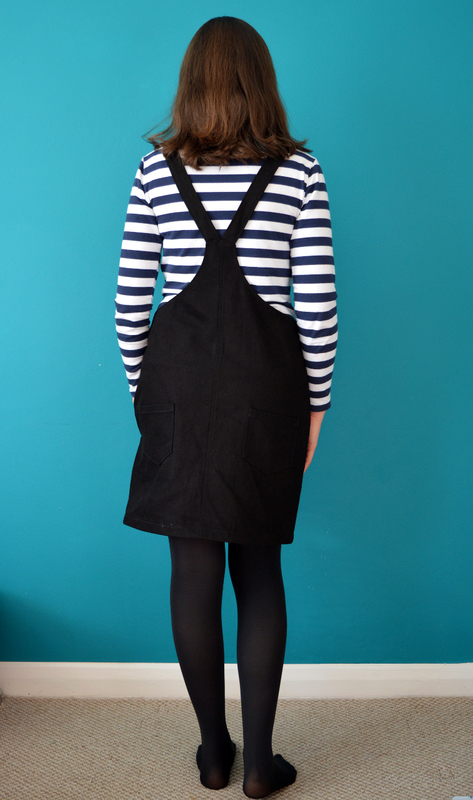 It is one of the few free kid's sewing patterns that is potentially suitable for chillier weather, so one that I'm keen to help people to discover if they didn't already know it existed. Thanks to B&T for making this available for free! 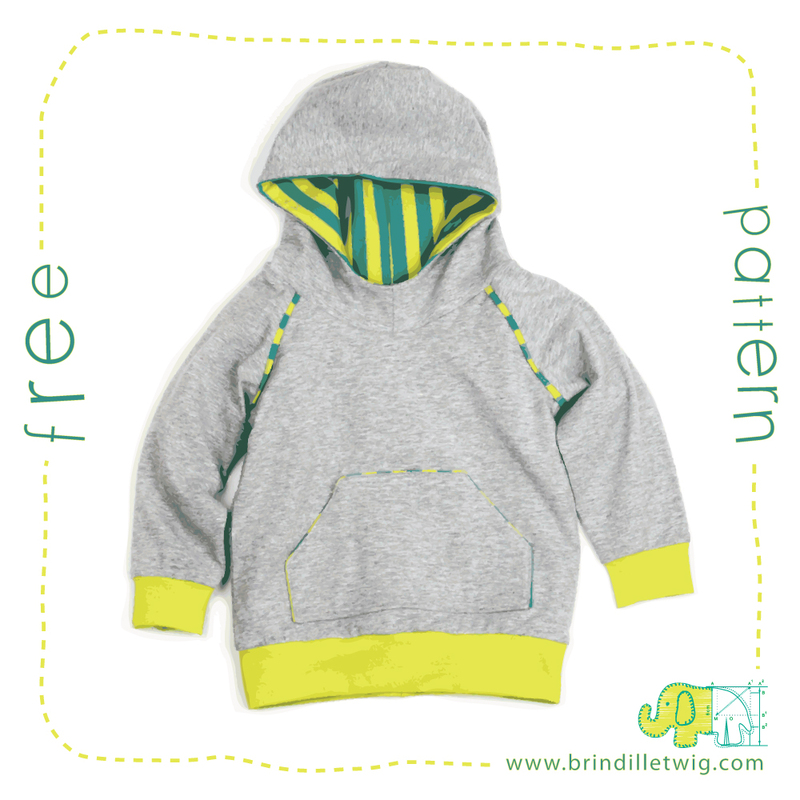 This is a multi-sized pattern from 0-3 months to 5-6 years. I made the 18-24 months size because I already had the pattern pieces for that size cut from the first time I made it. Frankie has just turned one and is fairly average sized. I usually find B&T patterns to come out about one size too big, so I was expecting this to be a couple of sizes too large for him at the moment, however I was surprised that this is actually only about one size too big, and he probably could get away with wearing it now. B&T suggest medium weight jersey, interlock or stretchy french terry for the body, sleeves and hood. They warn that using regular sweatshirt fleece may make it difficult to get over head, plus I'd say the arms might end up a little too tight. 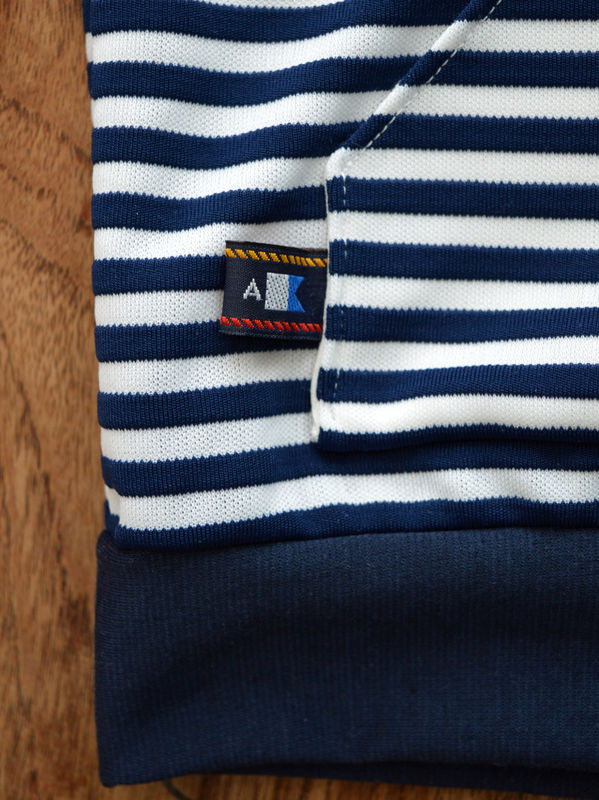 A cotton/elastane blend jersey or ribbing would be best for the cuffs and waistband. I used scraps of striped double knit and navy Ponte di Roma, and lined the hood with cream interlock: all leftovers from previous projects. This concoction has worked fine, but the interlock I used the first time round resulted in a softer and cosier garment. Beggars can't be choosers and I was limited by what was in my scrap box, so I feel my fabric combo hasn't produced the jazziest version of this pattern out there. I tried to add a bit of interest in the form of a little loop of nautical ribbon positioned into the side of the pocket. This PDF pattern is well produced and very typical of what you can expect from B&T patterns. The construction steps are illustrated with clear photos. I tend to find the scant seam allowances in B&T patterns (about 6mm if memory serves) a bit annoying, and it made the application of the sleeve seam piping a bit tricky. That said, this hoodie pattern comes together quickly and is a very satisfying make. add fins/eyes/teeth etc. to make the hood into the head of a shark/dinosaur/parrot/unicorn/anything! I love how many different looks you could achieve with this pattern by choosing different colour, pattern and fabric combinations. I definitely plan to make more in the future for both my kids, although I'll have to be quick in doing so for Dolores because she is fast approaching the largest size. I'd like to make a hoodie-dress for her, in a cosy fleece if I can find something stretchy enough. And the temptation to make one for Frankie with an animal face incorporated somehow will probably prove too hard to resist.